Hello everyone! Okay, so I had a different plan for reviewing this week, but… I HAD to share this book with you! MaryLu Tyndall, who is one of my favorite authors, is releasing her newest in the Legacy of the King’s Pirates series here in a couple of weeks. She was gracious to allow me an advanced copy in return for an honest review. Honestly? THIS BOOK WAS AWESOME!!!! So awesome, in fact, that I’m sharing my review now, and when it comes out I may or may not have something special planned. 😉 So stay tuned! So, wanna hear my thoughts on The Reckoning? MaryLu delivers yet again! Continuing what I believe to be her wonderful series, Legacy of the Kings Pirates, she has once again written a unique masterpiece. She has returned to the Caribbean, and filled this novel with rich settings: tropical paradises and ships upon the high seas. But this one has a bit of a twist: what if the heroine isn’t from the 17th century, but the 21st? Morgan isn’t your typical historical romance heroine. She’s used to jeans and t-shirts and iPhones, and does not like ships. So when she’s dragged aboard one by her friends, what’s a girl to do but wait for the tour to end? Unless of course your ex, who just dumped you, arrives with a woman per arm, then you hide, which Morgan does, and finds herself on a real pirate ship. I absolutely love the mix that MaryLu uses for this time travelling heroine! Morgan’s strong, very sure of herself, and has no problem standing up to ‘notorious pirates’, as she thinks they’re just paid actors, but she also settles semi comfortably into the 17th century world. There’s a unique blend of her modern sensibilities and knowledge, but also an acceptance of the world around her. Then there’s Rowan, our swashbuckling rogue of a hero, who has no problem keeping complete control over his men, but somehow can’t seem to get one little lady to listen. I love the sparks that jump from the page every time these two are in the same room! She’s so headstrong that she refuses to take orders, and he’s a pirate captain who runs his ship with complete control. The banter between these two is priceless! Think Much Ado About Nothing’s Benedick and Beatrice. The adventure these two take is a real joy to read, the search for gold that leads them through numerous battles. And then there’s the message, the message of trusting God, and the message that’s woven throughout all of MaryLu’s stories: redemption. Between a grand swashbuckling adventure, time travelling escapades, exotic locations, intriguing characters, a romance that blossoms so wonderfully, even midst enjoyable banter, and a deep message of trusting God, this book truly has it all. It is a book I highly recommend to anyone wanting a good read with deep meaning and leaves your heart feeling light and joyful. Seriously, this is a book not to miss! Currently only for pre-order for Kindle, but soon it’ll be available in other formats. And MaryLu is holding her month-long party to celebrate the release! Head on over to her website, and enter to win this awesome book yourself! And don’t forget to follow her on Twitter and Facebook to hear about what she’s cooking up next. I really hope you enjoy this book as much as I did! Like I said, I was provided a free copy for my honest review, but the words, and review, are completely my own. Edwardian Romance at its Finest! Hi everyone! Wow, I think this is one of my busiest weeks as far as people visiting. Thank you ALL for your support! I really hope y’all are enjoying my reviews, and hopefully finding some new authors and books to read. I fully believe in helping others find a good novel to pick up and read. This week is another double-fun week by the wonderful Carrie Turansky! Her series, Edwardian Brides, has two books out now, and a third coming this fall, and let me tell you, these were wonderful! Set in the Edwardian era (same as Downton Abbey) she does a wonderful job weaving the history and setting with a story that leaves you sighing. 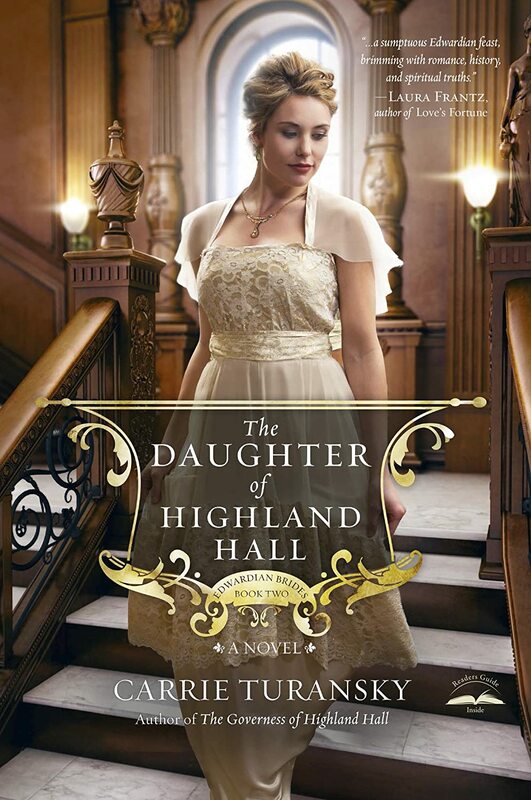 I’ll be sharing my thoughts on the first two books (The Governess of Highland Hall and The Daughter of Highland Hall) today, and am looking forward to sharing the third book when it comes out! 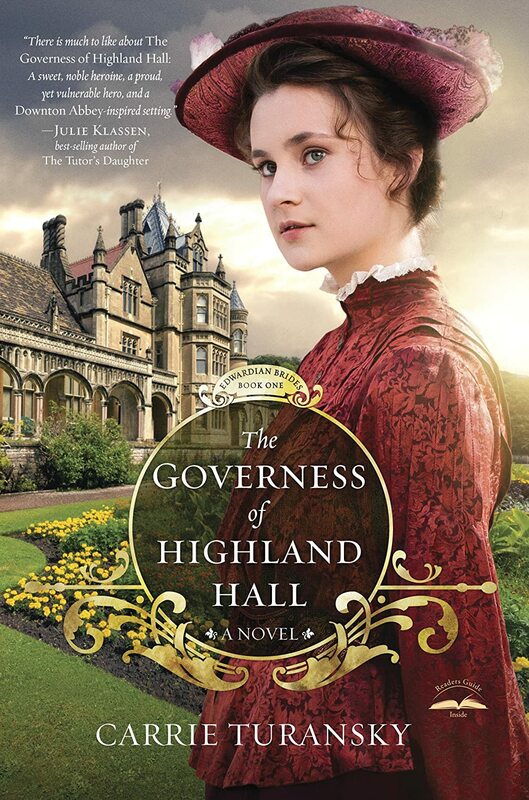 Though I usually gravitate to regency, I absolutely loved The Governess of Highland Hall, and couldn’t put it down! The setting is wonderful, an English country manor and rich estate, but it’s the characters that really make this story come alive. From the beginning, Julia seems to shine. She is both strong and humble as she seeks work to help her family. She is unafraid of working, though she feels out of place as a governess. She has this inner strength and kindness for children, and her patience allows her to reach both the little ones and even the older girls about to enter into society. Then there’s William, a good man, but one who is in way over his head. He has to raise four children, both his and his cousin’s, plus find a way to keep the estate from falling into financial ruin. It’s nice watching these two characters slowly learn to trust and respect each other (though their first meeting is probably one of my favorite meetings of romantic interests ever.) I love how each influences the other, helping them to see past their original narrow-mindedness. From the beginning, Julia fully believes she is destined to return to India, and William is looking for any way to gain enough money to keep the estate, including marrying well. But when love enters the equation, can they learn to let go of their initial goals to be with the one they love, or will duty to their families keep them apart? This is a great book about learning to trust God’s will rather than our own, with some wonderful characters in an amazing setting. The Daughter of Highland Hall, the second book in this series, delights just as much as the first! The setting, while changing from the English countryside to the hustle and bustle of London’s season, is no less vibrant than the first. Bringing many of the same characters, it can be read alone, but it’s also very nice to watch the growth of these characters. Katherine, from the first book, is spoiled and pompous, but somehow manages to weave her way into your heart. She enters society, a young woman ready to find her place in the world, but fully believes her place is as the wife of a wealthy gentleman. But as she spends more time in London, you get to see this glimpse of a good heart and a desire for more than gowns and balls. Then there’s Jonathan, who from the start has this desire to help the unfortunate as a medical student. He also has a big heart, but is torn between helping those who cannot pay him, and a prestigious position in a well known hospital. Both characters follow this journey of discovery, faced with the choice of taking the path filled with comforts and prestige, or the uncertainty of helping others. Like the first, I love how this story shows how trusting God’s will can lead to some rewarding surprises. I recommend both these stories for fans of regency and Downton Abbey.